Marine Le Pen disavows Jean-Marie Le Pen: French National Front leader will not support right-wing father's candidacy. 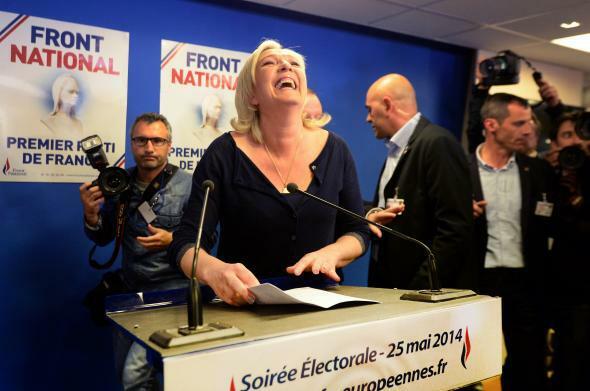 Marine Le Pen, the leader of France’s National Front party (FN), has announced that she will not support her father’s candidacy in this year’s regional council elections, AFP reports. The public split comes after comments downplaying the Holocaust by 86-year-old Jean-Marie Le Pen that could threaten his daughter’s efforts to attract moderate voters to the far–right-wing party he founded. Jean-Marie Le Pen is veering between “political suicide” and “a scorched earth strategy,” said Marine, 46. “His status of honorary president does not allow him to take the National Front hostage, to make such crass provocations that appear aimed at harming me but which unfortunately hit the entire movement, its officials, candidates, members and voters very hard,” she added. Marine Le Pen said she would oppose his standing in regional elections in December in what deputy party leader Florian Philippot described as a “total and definitive” split between father and daughter. Marine Le Pen’s attempts to move the National Front closer to the political center seem fundamentally incompatible with her outspoken father, who has recently repeated controversial statements that Nazi gas chambers were a small “detail of history” and praised French officials who collaborated with Hitler.